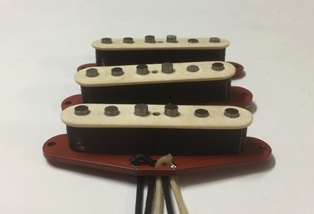 Home / Loaded pickguards / Leddin Handwound “Black Strats” Stratocaster loaded Parchment pickguard – Gilmour inspired tone! This product is currently available for purchase via the shopping cart but it requires 3 week minimum build time. Sorry for the inconvenience. 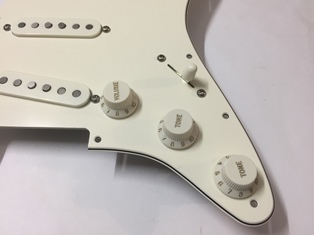 This loaded guard features my extremely popular Black Strat Gilmour clone pickups with a push/pull pot in the bottom tone position to engage the neck pickup in any position. 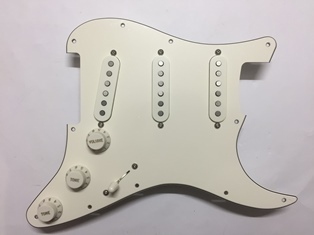 The guard is a 3 ply parchment Allparts 11 hole with USA/Mex hole spacing it may require a little jiggling for some guitars but will fit most. 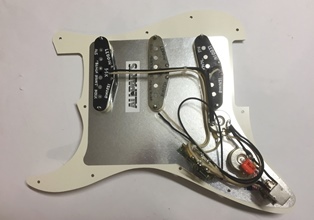 There are several stories about what was actually in David Gilmours Black Strat. For this set I have reviewed many articles and this is my version. 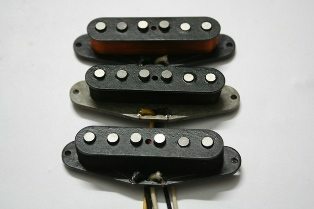 David’s bridge pickup was a Dimarzio FS-1 and having owned several originals in the past I am very familiar with it. My bridge is wound to 13k for a big fat punchy tone that breaks up crisply with drive. The middle pickup by some accounts was an overwound ’60s grey bobbin so I have done the same with my middle. At 6.15k this pickup is bright with a tight bottom end with a distinct late ’60s vibe. 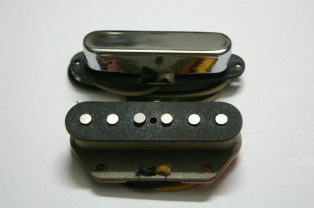 The neck pickup is an underwound ’50s Formvar wound to 5.45k for a nice clean vintage tone. Sound clips of the “Black strats” in action by Brisbane guitarist Nathan Moore.